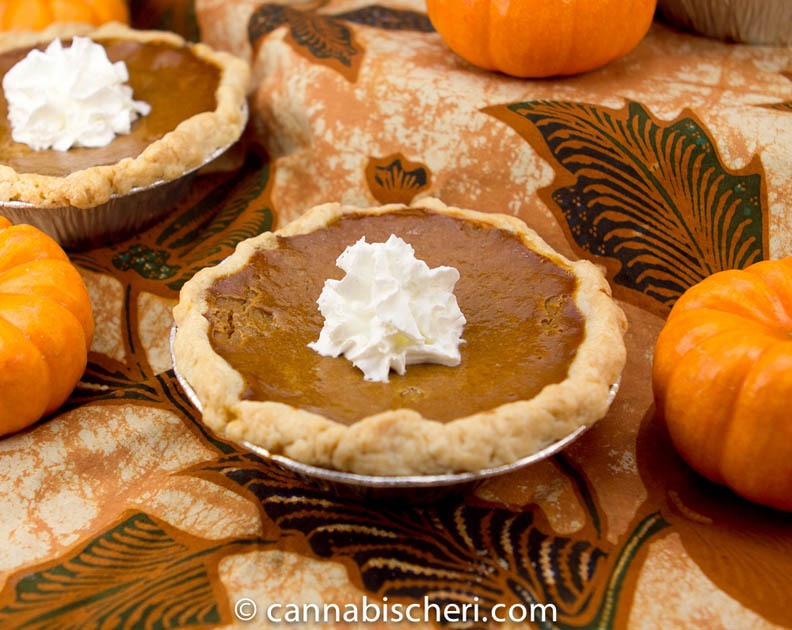 Here is the quintessential holiday dessert, kicked up with cannabis. I’ve designed this recipe to make four mini pies, each containing a single serving and a single dose of cannabis concentrate. (If you prefer you could also make this as a larger 9-inch pie, although this would give everyone a large piece of pie in order to achieve the proper dose). Conveniently, you can wrap the cooled pies in foil and freeze so you can save some for another time. Just bring to room temperature and enjoy! The dose below is only a suggestion. Be sure to read and understand Calculating Cannabis Doses in Edibles before attempting to cook with marijuana. Cut up the butter and shortening into small chunks and place it in the freezer for at least 15 minutes — the colder the better. Whirl flour, salt, and sugar in the food processor to blend. 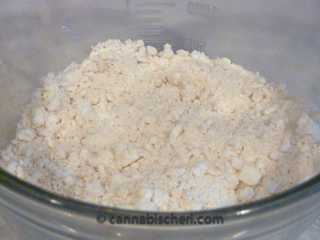 Add cold butter and pulse just until well incorporated — the mixture will resemble coarse crumbs (see photo, right). Remove mixture from food processor and place in a large bowl. Add ice water and mix with clean hands just until it holds together — mixture should be a little wet. Pat dough into a disk, wrap in plastic wrap and refrigerate for at least 20 minutes before rolling. The rule of thumb for flaky pie crusts is to handle the dough as little as possible. The best way I’ve found to do this is to roll the dough between two layers or plastic wrap or waxed paper. 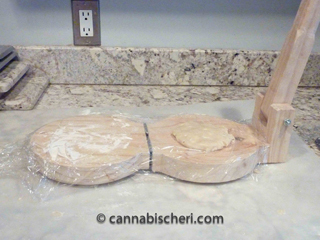 This method also makes it easy to transfer the dough into the pie plate. Remove your disk of dough from the refrigerator and divide it into quarters. Place one quarter on a piece of plastic wrap or waxed paper and lightly sprinkle with flour. Cover with another piece of plastic or waxed paper. Use a rolling pin to roll out dough into a circle about an inch larger in all directions than the pie pan. Remove top layer of plastic or paper, center upside down pie plate on dough, and flip the whole thing over. 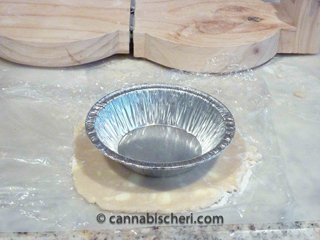 Remove second layer of plastic or waxed paper and press dough into pie plate. If desired, use fingers to make a nice edge on pie by evening out the edges then use thumb and index finger of one hand to pinch crust around the index finger of the other hand, to make a scalloped edge. Place pie crusts in freezer while you prepare filling. In a large bowl, beat eggs with an electric mixer until frothy. Add pumpkin, sweetened condensed milk or dulce de leche, salt, cinnamon, ginger, nutmeg, cloves, hash or kief, and vanilla and beat until well combined. Pour into prepared crust(s). Bake for 15 minutes, reduce temperature to 350 degrees F and bake for another 25 minutes or just until set. Serve warm, at room temperature or cold. Garnish with whipped cream if desired. Cool pies completely, cover tightly with foil and freeze. Bring to room temperature and enjoy, or if desired, reheat thawed pies in a 350 degree oven until warm, about 15 minutes. * Dulce de Leche, which technically means milk candy, is a thick caramel brown syrup made from sweetened condensed milk. It comes packaged in cans, like it’s close cousin sweetened condensed milk, or in plastic bottles. Nestles makes the most commonly found brand in the US, La Lechera. TIP! The Easy Way to Roll Mini Pies! I recently discovered the easiest way ever to roll dough for mini pies. You don’t even need a rolling pin, but rather a small tortilla press, found in Mexican markets and used for making tortillas. This little gadget also works exceptionally well for making mini pie crusts. 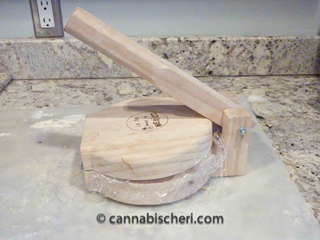 Place dough between a sheet of plastic wrap on the tortilla press. Press dough to get a perfectly sized mini pie circle of dough. Place in pie crust, pinch the edges and freeze! Author/activist Cheri Sicard wrote this article. Editor’s note: Cheri Sicard is author of The Cannabis Gourmet Cookbook (2012, Z-Dog Media), The Complete Idiot’s Guide to Easy Freezer Meals (2011, Alpha Books), and Everyday American (2008, Bookspan), among others. 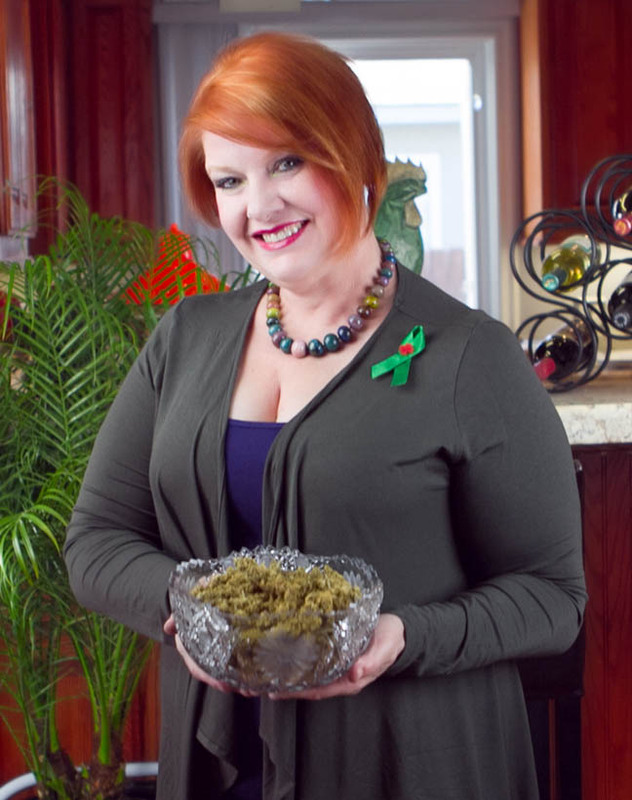 She is the Los Angeles County Community Leader for the NORML Women’s Alliance. You can read her blog at www.CannabisCheri.com.